In her celebrated fiction, Shirley Jackson explored the darkness lurking beneath the surface of small-town America. But in Life Among the Savages, she takes on the lighter side of small-town life. In this witty and warm memoir of her family’s life in rural Vermont, she delightfully exposes a domestic side in cheerful contrast to her quietly terrifying fiction. With a novelist’s gift for character, an unfailing maternal instinct, and her signature humor, Jackson turns everyday family experiences into brilliant adventures. "Many who profess an admiration for Shirley Jackson, often described as a 'writer's writer' do not usually include her thinly veiled memoirs of motherhood. But it is precisely these hilariously eviscerating, keenly observed, and genersou books that I and many other writers who happen to be mothers, adore. "As warm as it is hilarious and believable...Never has the state of domestic chaos been so perfectly illuminated." 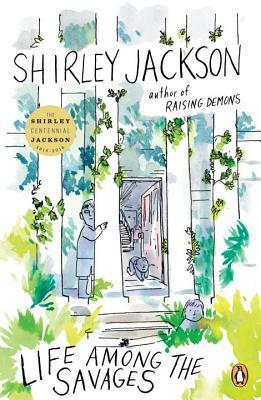 "When it comes to just sheer honest, wry, frustrated, finding-ways-to-appreciate-it writing about family life, we all sit at Shirley Jackson’s feet"
"Jackson artfully loves and portrays her children. She writes of their fast growth into formidable personalities with dismayed narration and lovely direct quotes, all charmingly subjective. Her view of their sayings and doings is certainly sophisticated but far from cynical or objective." "A housewife-mother’s frustrations are transformed by a deft twist of the wrist into, not a grim account of disintegration and madness, still less the poisoning of her family, but light-hearted comedy." "Jackson isn’t all eerie uncertainties and lonely housewives. Those who know her work only from 'The Lottery' or Hill House may be surprised to discover that she could also be very funny...Jackson’s two lighthearted memoirs, are filled with droll observations and amusing mishaps."